This entry was posted on June 24, 2018 by admin. 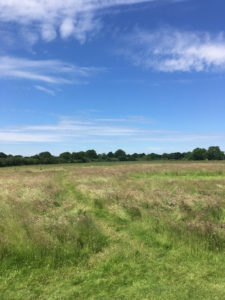 This month I found some time to spend four peaceful days with Mother Nature and no technology at Knepp, one of the largest rewilding projects in lowland Europe. Our ecosystems are broken and nature is struggling – with 56% of species in the UK in decline and 15% threatened with extinction. Biodiversity needs space to flourish. Across Britain, many places where you would expect wildlife to thrive have been reduced to wet deserts. The seabed has been smashed and stripped of its living creatures. We’ve suffered more deforestation and lost more of our large mammals than any European country except Ireland. We can’t build natural processes but we can help them re-assert themselves. For example, by reducing high populations of grazing animals to help natural woodlands grow. Or by reintroducing missing species to plug crucial gaps in the ecosystem. Or by letting rivers meander and follow their natural paths. By far the best introduction to this inspiring project is to watch their short video that explain how they made the transition from intensive farming to extensive farming and giving their 3,500 acre estate back to nature, and in doing so, gave a gift to us all. This was my first solo camping trip, and whilst I was at a camp site with other people, I felt in relative solitude in comparison to my normal day-to-day life. To further this feeling of solitude, I turned off my phone on arrival on Friday morning, and left it off until Monday lunchtime. Without a watch, turning my phone off also meant I disconnected from what I came to refer to as my 'time-telling device' in my journal writings. Losing this connection to time as we are accustomed to it in the modern world, was probably the most notable difference in my weekend experience. I did not miss other features of my phone: emails, calls, social media, entertainment; but it did feel strange to not know what time it was. I trusted that I could have a good guess by looking at the position of the sun, and other than that I had to settle into just 'being.' After some restlessness I began to adjust to my new way of being and started to really take notice of my surroundings and experience. One of my favourite things about Knepp are the majestic oak trees, surveyors of the land for hundreds of years, you can feel their wisdom in their wide trunks. There are a number of viewing platforms that have been considerately built on some of these trees to give better views of the landscape. I found myself in ceremony with some of these trees; walking around them, meditating with them and feeling a sense of pain and mourning for all the destruction that they have borne witness to. Another joy I found was the act of lighting my fire and cooking in the outdoors. It conjured up images of primitive times, and after my restless first afternoon, I found cooking my first meal grounded and settled me into my sense of place. The ritual act of lighting the fire to cook, gave a rhythm to my days that I looked forward to. Another blissful experience was the treat of having an open-air bath! 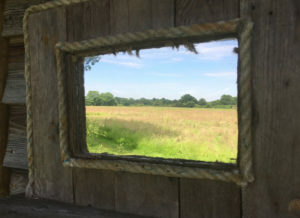 Knepp has created a little bit of rustic luxury with outdoor baths and showers, where I discovered that there is not much that can compete with lying in a warm bath on a summer's evening, looking at the blue sky, vibrant green leaves of the trees and listening to the birds sing. This is truly an inspirational place. 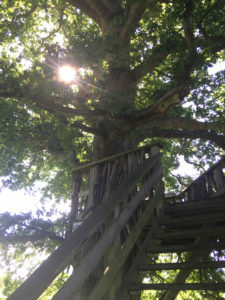 It has been beautifully and thoughtfully created for visitors to relax and spend a peaceful and blissful time in nature. 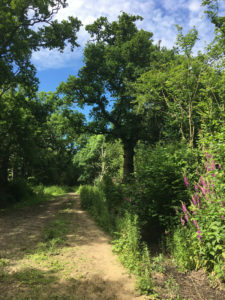 There is a map of the estate with four walking trails that are easy to follow and take you through different areas; from the shade of woodland, to meadows, rivers and ponds, and shrubland. It is unlike any other area of nature I have seen in my own country; the wildness reminded me of other parts of the world I have visited such as Sri Lanka, where nature is allowed to run her course, and humans live more in harmony with the land. 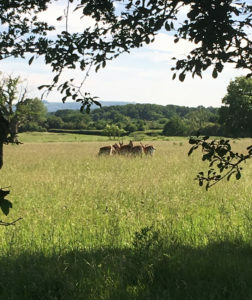 As stated on the Rewilding Britain website, rewilding is about wildlife returning and habitats expanding; people reconnecting with the wonder of nature and communities flourishing with new opportunities. Knepp meets these three aims, and any visitor will experience the wonder of nature. I am very grateful for being able to spend time in this magical place; from the birds singing, to the majestic oak trees, ancient paths and wild animals, it was a lesson in slowing down, noticing and appreciating.